Native to South America, the Macaw is truly an impressive bird that is highly intelligent and good talkers. Macaw’s come in a variety of sizes from smaller Hahn’s macaw to the much larger and very impressive Scarlet that can grow up to 3 feet in length. They are very intelligent, good talkers, and have the ability to outlive their owners (upto 100 years). They are highly social animals and benefit from an owner that is willing to provide them with sufficient attention to ensure they stay happy and healthy. Because of their size and strong beaks they can be destructive so it is important to provide with plenty of toys to chew on and keep them entertained. They are also excellent talking birds and benefit from an experience caretaker whom is able to provide ongoing training to ensure they don’t become tool excessively loud. Probably the most important factors to consider is when selecting a Macaw bird cage is the interior space. Most experiences would recommend getting as large a bird cage as you can afford. There are many sizes and types of Macaws so it is more difficult to provide a specific recommendation that fits all species. As a guideline, shop for a bird cage that allows you bird to flap their wings freely. For a small macaw, shop for a minimum cage size of 34” wide, 24” deep, and 36” tall. For a large macaw, shop for a minimum cage size of 36” wide, 48” deep, and 60” tall. Also important is the bar spacing. Shop for bar spacing of ¾ inch to 1 inch for smaller macaws and 1 inch to 1.5 inches for larger Macaws. Finally be mindful of the strength of the cage. 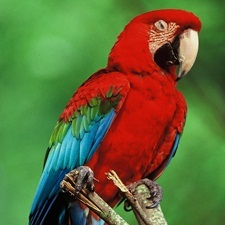 Macaws are strong animals and it is good to consult your retailer for cages that are built to accommodate large birds. All the brands we carry are from quality manufacturers and suitable for large bird conditions. Toys, toy, toys. All parrots like things to keep them entertained and alert. Macaw parrots are no exceptions and will benefit from have a wide variety of toys and activities in their bird cage. Rotate the toys and activities periodically to keep things fresh and changing, like the wild. - Macaw's (even smaller species) benefit from a larger cage, consider a minimum of 34" wide, 24" deep and larger.